The ancient Ba (巴) kingdom was located in the Sichuan basin with its capital in what is now Chongqing. Scholars have yet been unable to determine when it was established, but mention of a country by the name of Ba go back as far as the 13th century B.C. (!) where they appear on Shang dynasty oracle bones found at the Anyang archaeological site in Henan, which in turn represent the earliest known Chinese writing. In 703 B.C. the Ba first appear in official records where they helped the Chu kingdom against Deng. In 316 B.C. the king of Ba was captured by Qin, effectively disbanding the kingdom and incorporating it into the expanding Qin territory. According to a legend that was recorded in the 5th century Book of the Later Han (後漢書) by compiler Fan Ye, the Ba kingdom was founded by Lin Jun 廪君 who was elected chieftain over five native tribes. According to the Book of the Later Han he proved his worth over the other contenders by throwing a dagger into a crevice high up a cliff, and sail a boat on rough waters. After his death he turned into a white tiger, an animal since venerated by the Ba culture. Legend aside, the Ba kingdom was a fairly long lasting dynasty that was a confederacy of different, diverse tribes that recognized a single king. The Ba culture is otherwise somewhat mysterious because despite the relatively large size of the kingdom and their long existence, they didn't seem to have kept a written history and archaeological finds are scant. Archaeological evidence suggests they relied mostly on hunting and fishing for food. Weapons are abundant in Ba grave sites, along with a multitude of woodworking tools, but interestingly, agricultural implements are extremely rare. The Ba were described by neighboring cultures as a warlike people who often provided mercenaries for other states, in particular Chu with whom they had close ties, and their graves seem to confirm this reputation. Dating: Ba culture, 5th - 3rd century B.C. It is remarkably sophisticated in form, with a gradual taper from the base, accelerating near the point. It has a rounded central ridge with at either side a hollow section leading up to the secondary bevel that makes the edge. At the very tip this bevel is split in two with a very crisp center line. The short tang is pierced with two holes that once held pegs to hold the wooden plates which make up the handle, one in the center and one offset. The whole has developed a beautiful patina in various shades of dark green to light green, with varying depositions of azurite, malachite, and cuprite reds. 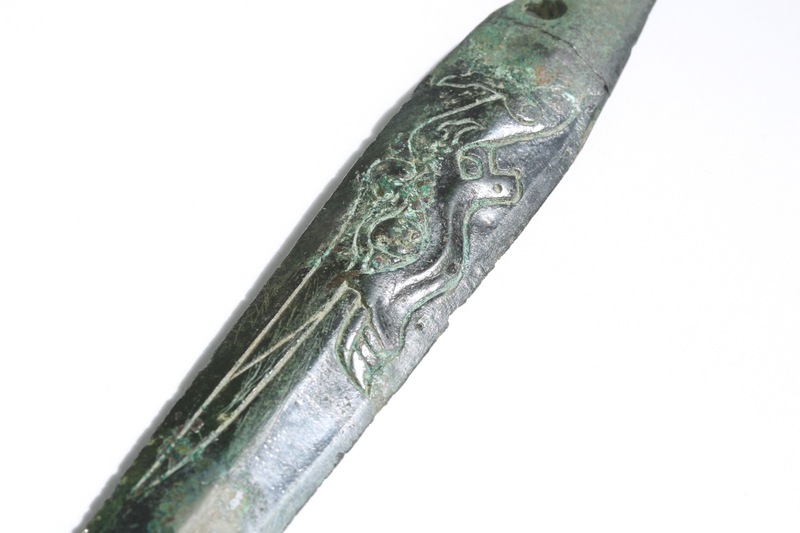 The base of the blade is decorated with an iconic symbol on either side, each being the mirror of the other side. Iconic emblems and what seems a form of script first start to appear on items found in eastern Sichuan by the 5th century B.C., mainly on weapons and in particular on these willow leaf swords, and they disappeared soon after the Qin unification in the 3rd century.3 The presence of an iconic design helps date our piece to approximately the 5th to 3rd century B.C. Most designs seem to depict animals, whether real or mythical. The design on this piece is no exception. The most striking elements are what appears to be a large eye in the center of the design, and a long protruding element that could be a crest, beak, or wing. The designs do not merely consist of lines, but have a three dimensional quality to them. A most fascinating element for the history of Chinese art is that there appears to be a second, smaller eye behind and above the main eye. If this is truly an eye, this is one of the first attempts in Chinese history to draw something in perspective. The other designs from this period tend to be strictly two-dimensional. Also curious: The "eyes" on one side have dimples that appear to represent pupils, while those on the other side lack these dimples and may represent closed eyes. Various comparable pieces have been found and published, most are held in Chinese state collections. See Yang Hong: Weapons in Ancient China page 158 for line drawings of pieces found in Zhaohua and Baxian counties, Sichuan. 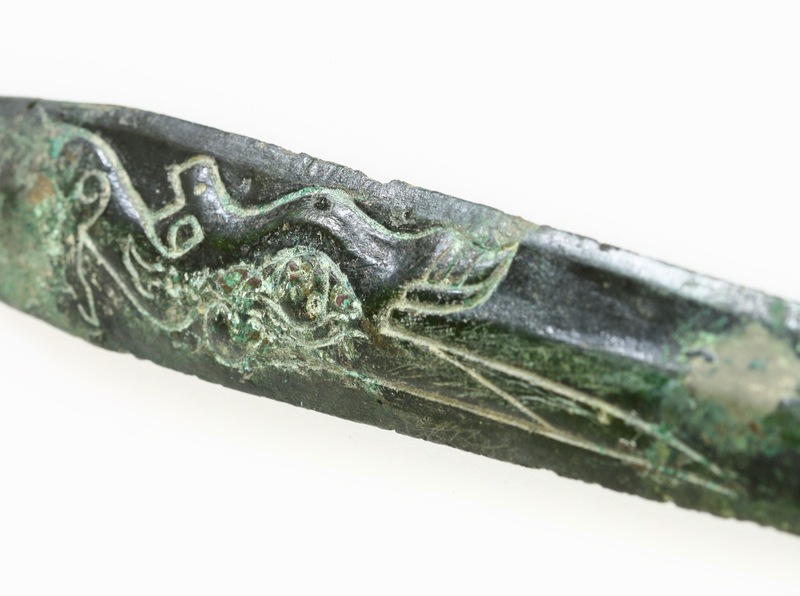 Also, on the same page, a rubbing of a bronze jian unearthed at Pixian county, Sichuan, in 1976. Lastly, four rubbings appear on page 159 of this work, showing some typical designs encountered of a human heart and a bent arm, and a tiger probably referring to the Ba myth of origin. Line drawings of others are included in Ancient Sichuan; Treasures from a Lost Civilization on page 42 showing both plain pieces and those decorated with what look like a tiger and a lizard respectively. 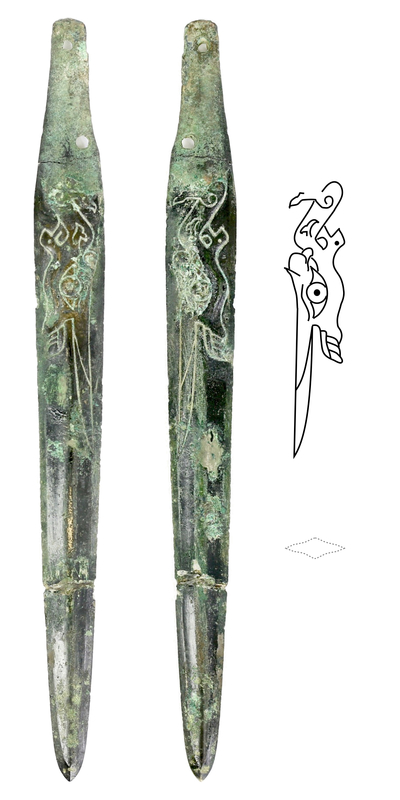 Page 211 of the same work shows a number of weapons found in the Yingjing Tongxincun tomb that were dated to the mid Warring States period (5th-3rd century B.C. ), among which three of these jian . Their blade decor includes a lizard like creature, the "heart and hand" symbol, a bird, and what seems to be a tiger. 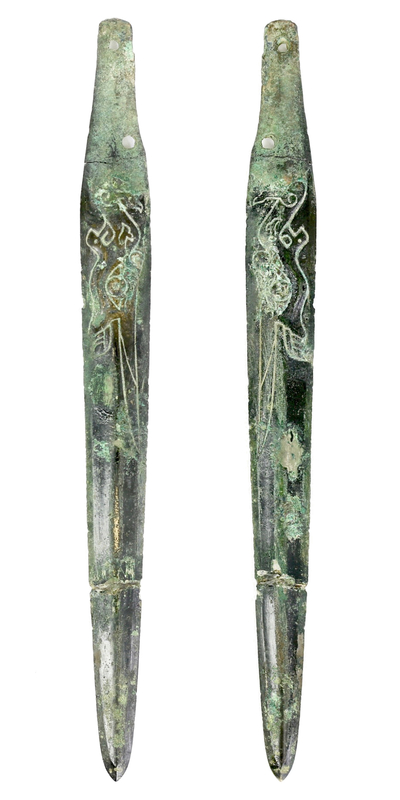 The most spectacular of the known examples is perhaps a sheath with two of these daggers, from a tomb at Zhongyi Xueyuan in Chengdu, dated to the 4th century B.C. which is published on page 236 of Ancient Sichuan . 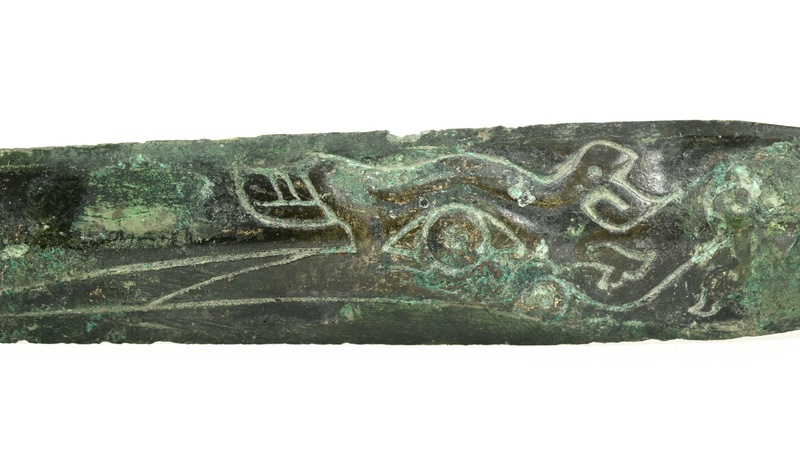 Three other such sets have been found, all in tombs in Chengdu. (Luojianan, Jinniuqu Baitacun and Qingyangxiaoqu.) Both are decorated with an abstract design that looks like two facing cicadas sharing a single head. 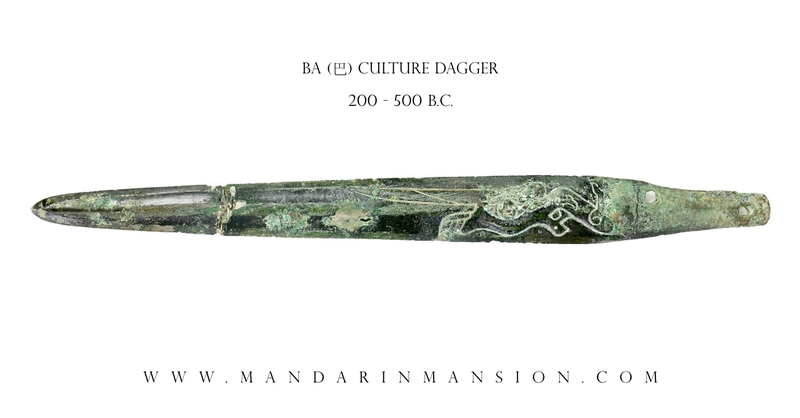 Page 244 shows a particularly notable dagger that was found in the Majiaxiang tomb at Xindu. Dated 4th century B.C., it survived in such good condition that it retains its wooden handle and cord wrapping. When checking databases of institutions in the western world, findings were barren. Not even the Metropolitan Museum in New York or the Freer and Sackler Gallery in Washington, both known for their sizable holdings of ancient bronzes, seem to have this type in their collections. An example with the common "heart and hand" icon was auctioned some years ago in New York for $7000,-. Four sets are found together with their scabbards that hold two of them each, which suggests these may have also been used as throwing knives. The piece described above is certainly well-weighted and well-balanced for this use. The fact that the Ba culture myth actually speaks of a knife throwing competition among the contenders to the throne strengthens the idea of a knife-throwing culture. Yet, any who have practiced this art -I have- will also have to admit that knife throwing is incredibly hard to do well. Especially when you yourself and the target are both moving. So perhaps the throwing of knives was a sport, or ritual pastime, rather than a fighting application. It could also be that the double knives in a single scabbard were meant for double wielding, with a dagger in each hand. The piece has been broken in three, and was glued together in recent times. The clean nature of the breaks suggests the material is quite hard, which is consistent with that we expect for the Ba culture, who were known to use brittle alloys that were high in tin. Otherwise in very good condition for age, with much of the surfaces still unaffected by corrosion. The piece is in stable condition, with just the forming of minerals here and there associated with its age. It comes with a thorough 12-page condition and authenticity report by Richard Nable of Priceless Past. The Ba culture may have existed for nearly a thousand years, yet archaeological finds are scant. 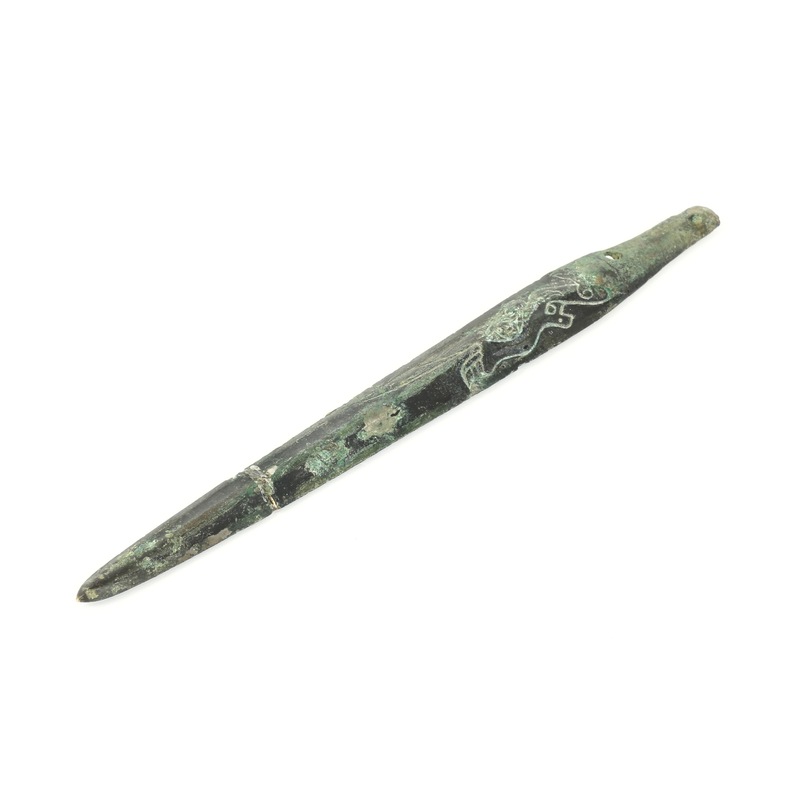 Among the grave finds of wealthy individuals are often a number short double edged daggers such as this one. Very few are circulating outside of China, where the vast number of known examples are held in Chinese national collections. Presented here is an interesting example in that its decoration differs from the common motifs found on the known specimens. It is a well-crafted piece that apart form the breakage survived in excellent condition. 1. Jiang Zhanghua (江章華) Ba Shu liuyexing jian yanjiu (巴蜀柳葉 形劍研究) (Research into the Ba-Shu “willow leaf-shaped” sword).” Kaogu 1996. 2. Yang Hong: Weapons in Ancient Chinea , Science Press, New York, 1992. Pages 157-159. 3. See: Robert Bagley (editor): Ancient Sichuan; Treasures from a Lost Civilization , Seattle Art Museum, Princeton University Press, 2001. Page 42.